Overview Ekke Wolf’s original plan for the Atlantic was to design a typeface in the Venetian Renaissance style, while still also allowing for a slight handwriting character and large ascenders. There is a wave-rolling unevenness in both the x- and the cap-height caused by the strong ductus pointing to the upper right, together with heavily curved serifs, resulting in a very lively text image. Atlantic – its name recalls stormy oceans, ships, tourism and so on. These are the themes Atlantic is best suited for, but it can also be used for other subject areas. 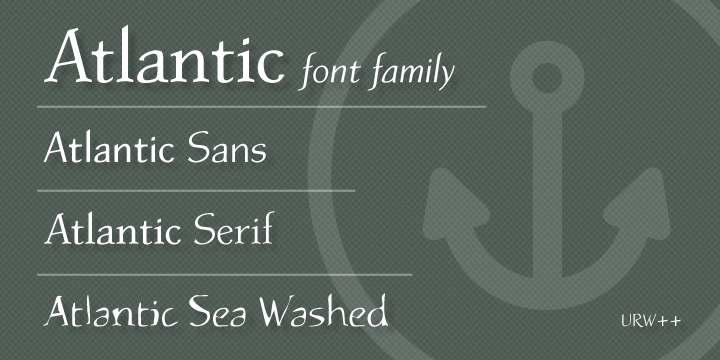 The family includes a serif, a sans, and a special variant – a “seawashed”.